Alexander H. Thackaberry has retired as President of The Boys’ Brigade in the Republic of Ireland after thirty-two years in service. His time as President has included events of historic importance including our Centenary celebrations in 1991 and the visit of the Brigade Council to Dublin in 2009. He motivated the amalgamation of various past member organisations into a unitary Stedfast Association and together with his wife Kitty participated regularly in its various activities. Right from the start of his presidency, he made it the primary objective of his office to visit and keep in touch with all our Companies, and to attend special events not only in Dublin but also around the country whenever possible. This undertaking has been magnificently fulfilled, and the District expresses the appreciation of all our Companies for this support and encouragement. Alex in boyhood served in the ranks of the l7th Dublin Company (St. Matthew’s Parish, Irishtown) but did not continue into leadership. He made his mark in the business life of the city, and this qualified him well when he was elected as Honorary Treasurer of Dublin Battalion on 19th June 1972. Nine years later, on 15th July 1981 he was elected Vice-President and subsequently, on 17th June 1985, President. What a remarkable record of service! 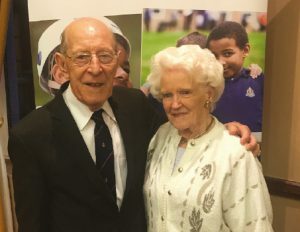 The Boys’ Brigade in the Republic of Ireland is greatly indebted to Alex and to Kitty, who has been his constant support and companion throughout his 45 years in the Brigade. Brian Weekes has been appointed as the new President for The Boys’ Brigade in the Republic of Ireland.